Sometimes you make treats you know are going to be good, but you don't quite know how good. 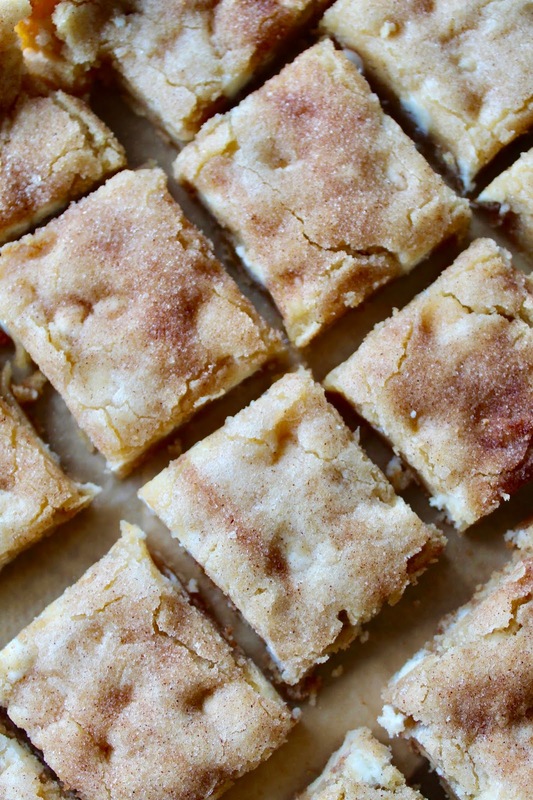 In the case of these snickerdoodle bars, they turned out EXTREMELY well. I think they're easily the best treat I've ever made and that's saying a lot. Yes, they have cinnamon, which you all know is one of my favorite flavors, but the texture and taste of these bars can't be beat! They baked perfectly and I couldn't be happier with the result. 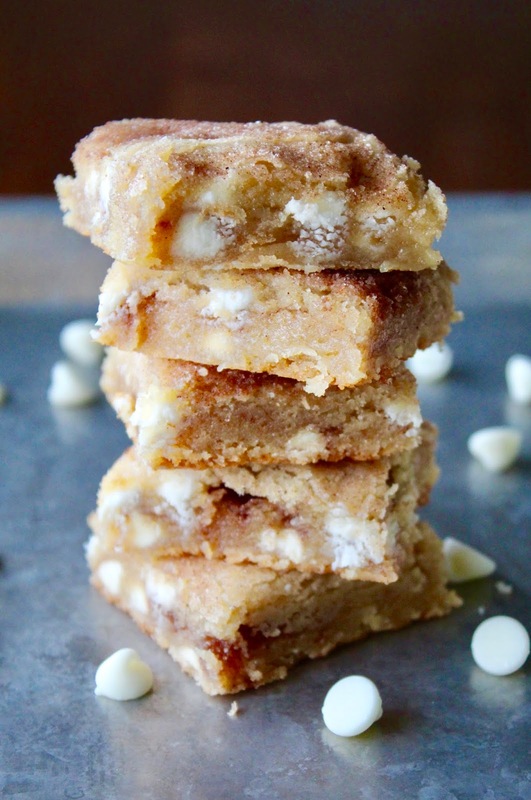 They're crispy on the outside, soft and gooey in the middle and have the perfect amount of white chocolate chips. I served them at a party and everyone loved them so I'd say they were a hit. You won't regret making these! 1. Preheat oven to 350 degrees F. Line a 9x13-inch baking dish with parchment paper or aluminum foil, leaving enough overhang on the sides to pull the bars out of the pan. 2. In small bowl, combine flour, baking powder and salt. Set aside. Using a hand or stand mixer fitted with a paddle attachment, beat the butter on high speed in a large bowl. Beat for at least 1 minute until creamy. Add sugars and beat for 2 full minutes on high speed until light and fluffy. Scrape down the sides and bottom of bowl as needed. 3. Beat in the eggs and vanilla on high speed, scraping down the sides and bottom of the bowl as needed. On low speed, beat in dry ingredients until just combined. 4. With a large wooden spoon or rubber spatula, fold in the white chocolate chips. 5. Spoon half the dough into pan. It will be a thinner layer, but try to spread it across the pan evenly. Combine the cinnamon and sugar, reserving 1 Tbsp. for the top and sprinkle the rest on the bottom layer. Spread the remaining dough over the top. Refrigerate dough for 20 minutes if too sticky. Sprinkle the top with remaining cinnamon-sugar. 6. Bake 22-24 minutes or until golden brown and toothpick inserted in center comes out clean. Cool completely for about 1 hour. When ready to serve, lift parchment paper or aluminum foil under bars onto a flat surface and cut evenly into squares.